Clinton Brick Mennonite Church, Goshen, Indiana. 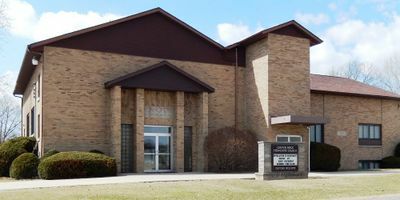 Clinton Brick Mennonite Church (Mennonite Church USA), located in Clinton Township, Elkhart County, near Goshen, Indiana, is a member of the Indiana-Michigan Mennonite Conference. The church was organized in 1854 with approximately 40 members, under the leadership of John Nusbaum, who served as the first pastor. In 1954 the membership stood at 154, most of whom were rural people. The first meetinghouse was a log structure, built in 1854, with a seating capacity of 100. In 1880 a new solid brick building was erected, which served the congregation until 1944, when it was destroyed by fire. In 1946 a new solid brick church was built which had a seating capacity of 300. Ministers who served for a length of time prior to 1950 were John Nusbaum, Henry Miller, Peter Lehman, John Garber, David Garber, Samuel Honderich, Amos Nusbaum, Samuel S. Miller, and Amsa H. Kauffman (1950). In 2007 the membership was 127; Daniel Z. Miller was the pastor. At a congregational meeting on 13 July 2014, a majority of church members voted to leave the Indiana-Michigan Mennonite Conference and Mennonite Church USA due to the increase it saw in LGBT inclusion in the conference and denomination. The removal from membership became effective on 1 October of that year. At that time the church changed its name to Clinton Brick Church. Groff, Anna. "Clinton Brick Leaves Indiana-Michigan." The Mennonite: Daily News/Updates. 16 October 2014. Web. 21 October 2014. https://themennonite.org/daily-news/clinton-brick-leaves-indiana-michigan/. Kauffman, Maxine. "History of the Clinton Brick Mennonite Church." Mennonite Historical Bulletin (March-June 1945). Kauffman, Amsa H. "Clinton Brick Church (Goshen, Indiana, USA)." Global Anabaptist Mennonite Encyclopedia Online. 1954. Web. 26 Apr 2019. http://gameo.org/index.php?title=Clinton_Brick_Church_(Goshen,_Indiana,_USA)&oldid=139945. Kauffman, Amsa H. (1954). Clinton Brick Church (Goshen, Indiana, USA). Global Anabaptist Mennonite Encyclopedia Online. Retrieved 26 April 2019, from http://gameo.org/index.php?title=Clinton_Brick_Church_(Goshen,_Indiana,_USA)&oldid=139945. Adapted by permission of Herald Press, Harrisonburg, Virginia, from Mennonite Encyclopedia, Vol. 1, p. 627. All rights reserved.